While Betty and I were at my husband's family reunion - cabins by the lake, family dinners, lots of kids running in and out and slamming doors - we worked on a project we had been talking about for years. Every time Betty and Louise and I go somewhere together, we find a pin to remember that trip. I have a list of everything on the computer, too. 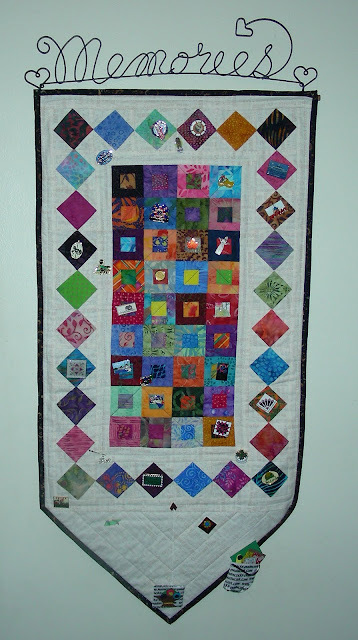 We made these pin quilts to display our collection. And then since Louise was not with us and she needed one too, so I took care of that for her!!! They have all just turned out great! What fun!! And Betty and I found the cute hangers at the quilt show in Knoxville. Betty's is first, then mine and then Louise's. It will be in the mail to her on Monday.